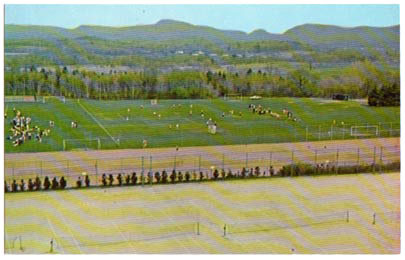 Hitchcock Field was developed in 1912-13 under the supervision of the Boston landscape architect Herbert J. Kellarway. 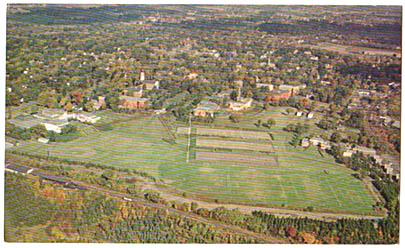 In its first stage, it included six tennis courts and a ball field, for the use of the student body (as opposed to the athletic teams) and named as a memorial to the late Dr. Hitchcock, pioneer of physical education at Amherst (King, 136). Twelve years later, again under the supervision of Kellarway, the field was completed with the addition of two more ball fields and eighteen more tennis courts in 1923 (King, 169). • Who Is Old Doc?